Deepa Kundur is a Professor of Electrical & Computer Engineering at the University of Toronto. She currently serves as Chair of the Division of Engineering Science and as Director of the Centre for Power & Information. 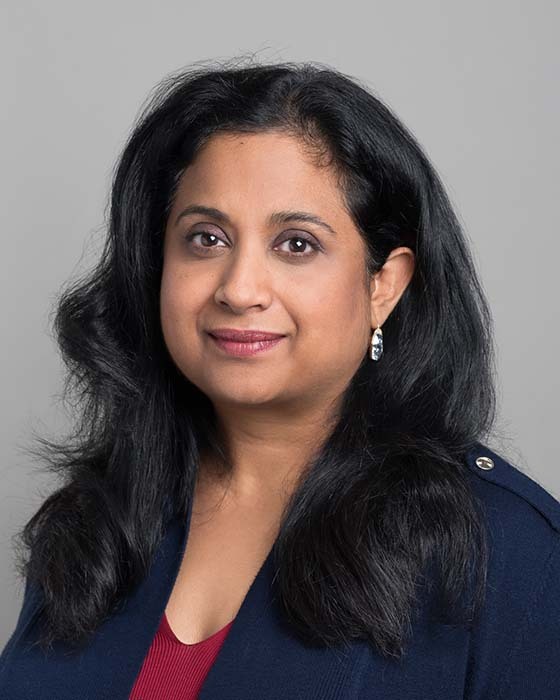 A native of Toronto, Canada, she received the B.A.Sc., M.A.Sc., and Ph.D. degrees all in Electrical and Computer Engineering in 1993, 1995, and 1999, respectively, from the University of Toronto. Professor Kundur’s research interests lie at the interface of cyber security, signal processing and complex dynamical networks. She is an author of over 200 journal and conference papers. She is also a recognized authority on cyber security issues and has appeared as an expert in popular television, radio and print media. Professor Kundur has participated on several editorial boards and currently serves on the Advisory Board of IEEE Spectrum. She currently serves as General Chair for the 2018 GlobalSIP Symposium on Information Processing, Learning and Optimization for Smart Energy Infrastructures, and TPC Co-Chair for IEEE SmartGridComm 2018. Recently, she also served as Symposium Co-Chair for the Communications for the Smart Grid Track of ICC 2017, General Chair for the Workshop on Communications, Computation and Control for Resilient Smart Energy Systems at ACM e-Energy 2016, General Chair for the Workshop on Cyber-Physical Smart Grid Security and Resilience at Globecom 2016, General Chair for the Symposium on Signal and Information Processing for Smart Grid Infrastructures at GlobalSIP 2016, General Chair for the 2015 International Conference on Smart Grids for Smart Cities , General Chair for the 2015 Smart Grid Resilience (SGR) Workshop at IEEE GLOBECOM 2015 and General Chair for the IEEE GlobalSIP’15 Symposium on Signal and Information Processing for Optimizing Future Energy Systems. Professor Kundur’s research has received best paper recognitions at numerous venues including the 2015 IEEE Smart Grid Communications Conference, the 2015 IEEE Electrical Power and Energy Conference, the 2012 IEEE Canadian Conference on Electrical & Computer Engineering, the 2011 Cyber Security and Information Intelligence Research Workshop and the 2008 IEEE INFOCOM Workshop on Mission Critical Networks. She has also been the recipient of teaching awards at both the University of Toronto and Texas A&M University. She is a Fellow of the IEEE and a Fellow of the Canadian Academy of Engineering. Fellow, Canadian Academy of Engineering (2016) for path-breaking engineering research at the interface of information processing and cyber security. IEEE Electrical Power and Energy Conference Best Paper Award (2015) for paper entitled “An Evolutionary Game Approach to Predict Demand Response from Real-Time Pricing” by Lee and Kundur. IEEE Smart Grid Communications Conference Best paper award (2015) for paper entitled “A Systematic Approach to Delay-Adaptive Control Design for Smart Grids” by Farraj, Hammad and Kundur. Elevation to IEEE Fellow (2015) for contributions to signal processing techniques for multimedia and cyber security. Best student paper award finalist (2012) at the 25th IEEE Canadian Conference on Electrical & Computer Engineering for paper entitled “On the Use of Cyber-Physical Hierarchy for Smart Grid Security and Efficient Control”; role: faculty co-author. Best Paper Award Finalist (2008) at IEEE INFOCOM Workshop on Mission Critical Networks for paper entitled “A Secure Integrated Routing and Localization Scheme for Broadband Mission Critical Networks”. Outstanding Professor Award (2007) awarded by the Department of Electrical and Computer Engineering, Texas A&M University. Association of Former Student’s Distinguished Achievement Award – College Level for Teaching (2006) presented by The Association of Former Students, Texas A&M University, for outstanding service to faculty, staff and students; this prominent award is one of the most coveted recognitions that can be bestowed upon a faculty member of Texas A&M University. Tenneco Meritorious Teaching Award (2005) presented by the Dwight Look College of Engineering at Texas A&M University, for excellence in instruction, dedication to students, and outstanding commitment to engineering education at Texas A&M University. Best Electrical Engineering Professor Award (Spring-term) (2002) given by the ECE Club (ECE Department undergraduate students) at the University of Toronto, by popular vote. Gordon Slemon Teaching of Design Award (2002) awarded by the ECE Department, University of Toronto, for excellence in teaching and design project supervision. Infrastructure Award (2001) awarded by Canada Foundation for Innovation (CFI) and Ontario Innovation Trust (OIT). University of Toronto Fellowship (1997-1999) awarded by the ECE Department, University of Toronto for doctoral studies. NSERC PGS B Scholarship (1995-1997) awarded by the Natural Sciences and Engineering Research Council of Canada for the first and second years of doctoral studies. NSERC PGS A Scholarship (1993-1995) awarded by the Natural Sciences and Engineering Research Council of Canada for the first and second years of masters studies. Department of Electrical and Computer Engineering Teaching Assistant Award (1995) presented by the undergraduate students of the Department for excellence in teaching. Edward S. “Ted” Rogers Fellowship (1993) for academic excellence by a graduate student in the Communications Group at the University of Toronto. A Governor General’s Academic Medals Program Certificate (1993) for exceptional academic performance in an undergraduate degree program in Canada. SCIEX Industrial Scholarship (1993) in recognition of excellence in instrumentation design. F.C.C.P. – John Hin Chung Tsang Memorial Scholarship (1993) for graduating from Electrical Engineering undergraduate program with the highest standing in telecommunications courses at the University of Toronto. J. E. Reid Memorial Prize (1993) for achieving the highest aggregate percentage in the Fourth Year subjects pertaining to electronic communication at the University of Toronto. Andrew Alexander Kinghorn Scholarship (1990) for achieving the highest average in the first year of studies for all undergraduate Engineering programs at the University of Toronto. Canada Scholarship (1989-1993) awarded by the Canadian Government for academic excellence in high school and for maintaining an honours standing in university. J. W. Billes Open Entrance Scholarship (1989-1993) awarded by the University of Toronto for academic excellence in high school and for maintaining an honours standing in university. Ontario Energy Board Working Group on developing a Framework for Protecting Privacy of Personal Information and the Reliable Operation of the Smart Grid in Ontario Steering Committee, steering committee member, June 2016 – present. IEEE Smart Grid Communications Subcommittee of the IEEE Communications Society, steering committee, 2014.